A small (23-28 inches), thick-set heron, the Black-crowned Night-Heron is most easily identified by its gray wings, black back and head, pale breast, and, in the breeding season, twin white head plumes. Where their ranges overlap, this species may be distinguished from its relative, the Yellow-crowned Night Heron (Nyctanassa violacea), by the latter species’ black face, gray breast, and, logically, by its yellow crown. Male and female Black-crowned Night-Herons are similar in all seasons. 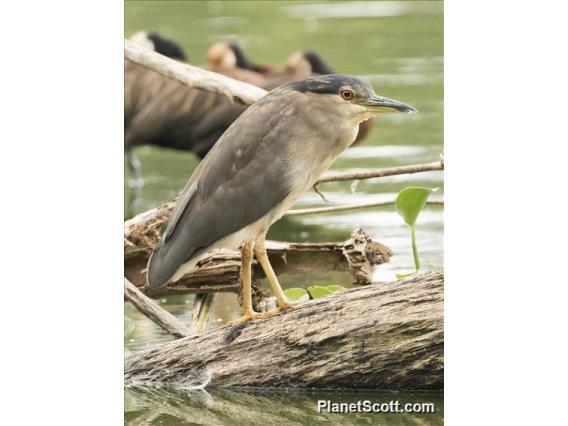 The Black-crowned Night Heron inhabits every continent except Australia and Antarctica. In the North America, this species breeds at lower elevations across much of the United States and southern Canada. Some populations in warmer areas are non-migratory, but others migrate south to the southern U.S., interior Mexico, and Central America. Elsewhere in the New World, other populations exist in the West Indies, coastal Mexico, southern Central America, and South America south to southern Argentina and Chile. In the Old World, this species inhabits warmer parts of Europe, Asia, and Africa, with populations ranging from sedentary to fully migratory depending on climate and habitat. Black-crowned Night-Herons inhabit a variety of wetland habitats, whether flowing or standing, large or small, and freshwater or saltwater. In tropical areas, this species may be found in mangrove wetlands and lagoons. Black-crowned Night Herons primarily eat a number of plant and animal foods, including small fish, crustaceans, mollusks, reptiles, small mammals, and aquatic plant seeds and vegetation. Black-crowned Night-Herons may be best observed wading in shallow water, where they may be seen plunging their bills into the water to catch fish. It is also possible to see Black-crowned Night Herons at their nesting colonies, especially when they return to roost, or while flying with their feet extended and their necks pulled in. As its name suggests, this species hunts mainly from sunset to sunrise, although individuals may be seen during the morning and afternoon as well. Bibliographic Citation: Rumelt, Reid B. Nycticorax nycticorax. June-July 2012. Brief natural history summary of Nycticorax nycticorax. Smithsonian's National Museum of Natural History, Washington, D.C.
Not 100% sure on these as it was dark.